9 DVDs · approx. 19 hrs. 45 mins. item #<&id> · ONLY $<&<&id>_saleprice>! The number of American adults who didn’t finish high school is truly staggering. Some wish they could get a “second chance” by earning their high school equivalency credential, but many find the GED exam too intimidating. They’re overwhelmed by the thought of having to learn or relearn school subjects by plodding through dry textbooks or sitting through tedious classes. Well, if any of this sounds familiar, you’re in luck! Now you can study with the GED experts — on your schedule and at your pace. With over 30 years’ experience preparing students for high school equivalency exams, Video Aided Instruction has made getting that passing score easier than ever before. 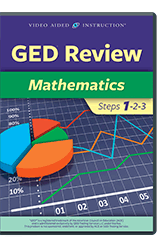 Our comprehensive GED Review series is the ultimate resource for conquering the exam. Featuring real teaching by real teachers, these developmental study programs start with the basics, develop your skills, and take the stress out of learning. 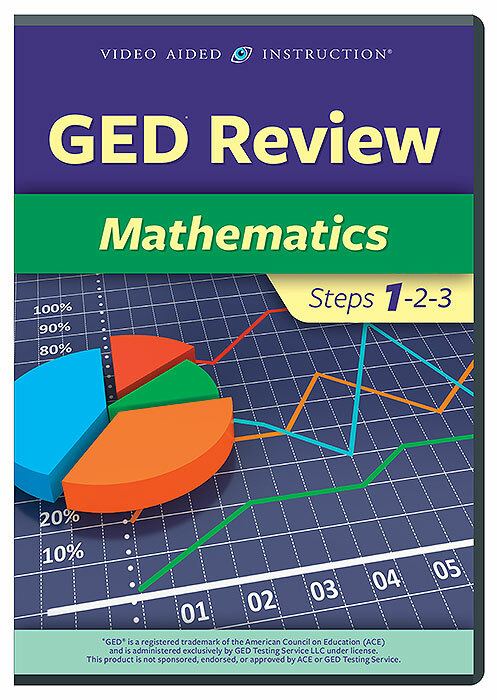 With this volume, even the most “math-phobic” among us can learn how to succeed on the Mathematical Reasoning sections of the GED exam. Your dynamic instructor shows you step-by-step solutions to hundreds of practice questions at the chalkboard. Along the way, he explains every math concept in plain English, so you can easily master the essentials of arithmetic, algebra, geometry, and data analysis — and learn foolproof techniques for tackling even the most challenging problems. It’s like having your own private math tutor! So don’t let your lack of a high school diploma hold you back — a brighter future is now within your reach. Let Video Aided Instruction be your guide! Copyright ©2014 Video Aided Instruction, Inc. All Rights Reserved.